Le Glamizer ®, un lisseur à cheveux pas comme les autres ! Home / Glamizer®, a hair straightener like no other! Glamizer®, a hair straightener like no other! Ultra soft and slightly curved, the Glamizer hair straightener® allows a multitude of chic and glamorous hairstyles. The Glamizer® is unique: with its “Custom Glamizer”, it fits tailor-made to any type of hair, even the most delicate. All the desired effects are possible and you can therefore satisfy all your hairstyle desires and create every day a unique look. GLAMIZER HAIR STRAIGHTENER® IS EQUIPPED WITH “ADVANCED CERAMIc” TECHNOLOGY. This hair straightener is available in our partner salons and in our online store. 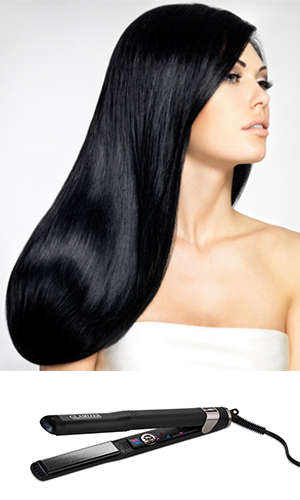 For beautiful, shiny, flowing hair!